Sarah Wilbanks uses images of maps, photographs and ephemera that she transers to polymer clay and sets in silver. “I just love finding images with history, story, line, color, texture and putting them together to create narrative,” she says. 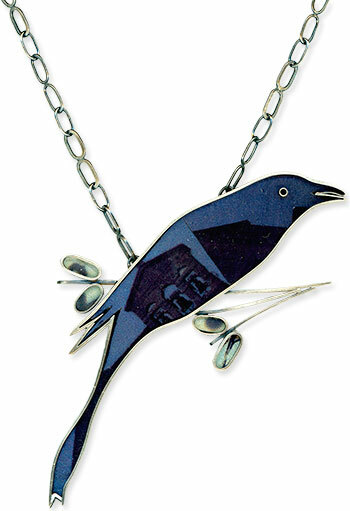 The grackle is perched in her bird-themed gallery. Sarah’s pieces are made of recycled sterling silver in her Seattle studio/apartment. She’s unveiling her new production line at her first retail show November 23-24. Her work is also at the Seattle Art Museum (SAM) store and she’s opened an Etsy shop. Her Facebook page offers the best spot for browsing through her studio and her new line. clean, modern and organic. beautiful! So striking! Love the details. I like the bird eating white berries.